When we are uncertain or facing something new, we often turn to guide books and people that tell us what to do, lists of tips, books that tell us what to expect and make everything seem black and white, straightforward and under control – predictable. A predictable birth would be nice, wouldn’t it! But how far will this knowledge really go in preparing you for your own unique labour and birth? Not far enough! When I was preparing for my first birth I focused on learning about pregnancy and labour from experts, guide books and the hospital antenatal class. I wanted to be well prepared and give my baby the best beginning possible. I read some birth stories (in Ina May’s clasic book Spiritual Midwifery but they were a little too alternative and hippy for me at the time. Never having experienced labour I found it very hard to imagine what it would be like and these stories were hard to relate to. The women were not like me and the stories were set in a different country, a different time, and a different culture. The way of speaking about birth and the feelings these women described were too much of a leap for me! I couldn’t connect with them. (I suggest reading the newer Ina May’s guide to childbirth instead). The information I had taken in and given highest priority was how I would know when to go into hospital. And to judge this, I needed to know what the different stages of labour were. I thought they would be clear, distinct stages based on the clear, predictable flow charts and diagrams of the antenatal classes. Even though I had come to believe that birth should work and I was determined to have a vaginal and drug free birth, I was still scared. And very honestly, who wouldn’t have some level of fear going into the unknown? Focusing on this kind of information about birth made it seem more controllable and less unpredictable. It made me feel a bit safer but really it was false confidence. I had expected that a first labour would begin slowly and it would take time for the contractions to reach five minutes apart and then three minutes apart and then closer and closer together until transition. I thought there would be a roughly thirty minute second stage, then the birth of my baby and a syntocinon injection in my thigh at the moment of birth. The birth of the placenta would follow in five minutes or so. Once my labour began, I learnt that birth is not predictable and it is not black and white like the nice neat charts in the antenatal class! My contractions were immediately five minutes apart when I awoke in the morning. I couldn’t rest, ignore them and pretend it was just another day because they felt strong. Although I knew that first births could take several days, the pattern of contractions I was experiencing didn’t match the description of a slow first birth. With contractions 5 minutes apart and strong enough to need my attention, I concluded that I must already bein active labour. I thought this baby might be born before the day was over! I went straight into “being” in labour, using my yoga and active birth positions, my meditative breathing. I stayed on my feet nearly all day because I found this position most comfortable and I knew that an active upright labour would help me give my baby a natural and drug free birth. In fact, my contractions stayed at five minutes apart for most of my 28 hour labour, moving to three minutes apart after about ten hours of labour and then spacing out to ten minutes apart when I arrived at the hospital. I had responded to early labour as though it was active labour. And this set me up for frustration and disappointment, as well as exhaustion and weakness due to not eating or drinking enough. When the second stage took over two hours I felt a mix of exhaustion, helplessness, fear and anxiety. Much of this stemmed from expecting a 30 minute second stage based on the charts we were shown in class. I knew my labour was pushing the boundaries of what labour in my hospital was expected to look like and I was surprised they had let me push for so long. I knew I was approaching the deadline for the second stage till the birth of the baby. It was not only incredible fatigue, but fear of what alternatives were just around the corner (a caesarean? I was terrified of that) that prompted me to ask for a vacuum extraction. My baby was crowning but I didn’t believe I could go on and no one there could have convinced me otherwise! I imagine that continuity of care with a midwife or doula might have made all the difference because they would have known me well enough to reveal the fear behind my choice. I would have trusted their words when they told me he was really very nearly here and I could go on. Nonetheless it was my choice and at least I was in control – no one took ownership out of my hands or pressured me into the choice. When my placenta did not arrive smoothly and easily as I had expected after the syntocinon injection (it was presented as the only way to birth the placenta and avoid a haemorrhage) the midwives pushed and pulled to get the placenta out. I was feeling frightened. I knew my placenta was not behaving in the way it was expected to. Anything outside of the norm on the charts we had been shown in our classes might mean further medical assistance was required. It wasn’t a pleasant experience, but I avoided an operative removal of the placenta that would have been the next step. Like my baby’s birth, the birth of his placenta had required patience but once the syntocinon injection was given there was another deadline to meet. This rough birth of my baby’s placenta no doubt contributed to the uterine infection I suffered from 10 days post-birth. It landed me in the emergency ward at 3am. It was a bit scary with a newborn! On the other hand, the private room where my husband was allowed to stay, all our meals and plenty of care and baby support from the midwives and nurses actually gave me a chance to recover from my post birth exhaustion and shell shock. By the time I went home a week later I felt a little more ready for motherhood. I share this part of my first birth story because it is just so common for women to be surprised, confused and misled like I was when their first birth does not match the descriptions, the timings and measurements given in classes and guidebooks. In the effort to communicate clearly and simply how an average labour is expected to look in a particular hospital and when they would like you to present to the maternity ward, labour is distilled down to a series of distinct stages. Measurements of contractions and dilation and your mood are focused on as the key indicators of progress. While you may find it useful to focus on these details to distract yourself from labour, this behaviour keeps you in your head, using your thinking self. It doesn’t help you to slide into the instinctive and internal state that nature intends us to enter during labour for optimal pain relief and progress. If there is a mismatch between your expectations of what a “well-behaved” labour looks like and the reality of your labour, it can lead to assumptions about how your labour is progressing (or not), unwarranted excitement or anxiety, fatigue, disappointment and fear. Each of these emotional states may have a negative impact on the progress of labour and the choices you make during labour as a result. A medical, technical, scientific model of labour doesn’t teach us all we need to know, or prepare us for our own experience of labour and giving birth. What does teach us what we need to know about birth? Starting in childhood, we have gathered another kind of knowledge about birth. This is the knowledge we have gained from the stories we have been exposed to from family, friends, TV, books and the media. Sadly, these stories are rarely positive, reassuring or inspiring. Many women have grown up surrounded by birth stories of frightening and dangerous emergencies, complicated births or the belief that birth doesn’t work. These stories tell us to expect pain, danger and complications and quite naturally we often respond with fear and anxiety about birth. Once pregnant, many of us are further exposed to unasked for and unwanted discouraging stories. If you consider, for a moment, the impact negative stories of birth have, the vivid images, the words, and the ideas they have planted in your memory and your imagination, then it isn’t so hard to see the incredible value of positive stories. The knowledge held within positive stories is different to the information we gain from text books or instructional classes. Stories are personal, emotional and evocative. They contain a very potent kind of knowledge that has a deep impact on us because it is emotional as well as informative. Stories speak to our hearts and minds. Stories also educate us on the shades of grey that are left out when we read instructional guides. Positive birth stories that we can relate to gently show us what is possible, let us into a woman’s deeply personal experience, and offer us the opportunity to learn from her. Stories can take us into the world of labour and birth both physically and emotionally in a way that textbook descriptions can never do. Stories give a sense of what it feels like to experience birth and give the knowledge that every labour and every birth is different. When we read a number of stories we start to recognise how different ways that labour develops – we can see labour building and recognise changes in the woman’s feelings, thoughts, her instinctive behaviours, her needs and how she responds to these. We hear women describing the days leading up to birth, sharing how they suddenly, urgently needed to “get things done” shortly before labour begins. Others share how they had an emotional release, crying and crying, in the days before labour – clearing their mind and body of stress and anxiety. And other women insist “No! I’m not in labour!” when their behaviour indicates that they are, even if their labour is not following the pattern they expected. This teaches us that there are many different signs that labour is imminent and sometimes we can be caught by surprise because we are looking for signs that aren’t there or missing those that are. We also learn that sometimes early labour takes days and sometimes women are not aware of being in labour at all. Sometimes women wake in the night when they are suddenly thrust into a fast, active labour lasting only an hour! Through positive stories we learn the thoughts, feelings, movements and actions that women find beneficial in labour. We see how they breathed, the way they walked up and down, climbed stairs, swivelled their hips, used yoga poses, knelt on all fours, bounced on a birth ball or squatted. We learn through other women when these movements were most comforting or useful. This gives us knowledge of the many different ways to labour and we learn that if one position or movement isn’t quite right, we will remember something that another woman tried and have the confidence to give it a go. We don’t feel as reliant on someone to tell us what to do because we have inherited the experience of many other women through their descriptive and detailed stories. We see how partners, doulas, mothers, sisters, or friends support women physically and with encouraging words. And we can see how sometimes these words and actions make the woman feel amazing, and sometimes she swats them away like a fly because it just isn’t what she needs right now! This teaches us the value of having the right support people and also that we can’t predict exactly how we will be feeling and what we will want! We need support people who are completely there for us and not focused on themselves and their own feelings. We also see the powerful impact of negative or frightening words on labour and this lets us know we need to protect ourselves from the impact of these – a doula is a good choice for this role. We get inside women’s heads and we hear the words she said, thought or remembered that were helpful. And if we find ourselves in a similar situation, her words come to us and become our own words. We learn about the sounds she made – did she roar like a lion, did she moan and sing, did she chant, or was she completely silent? We see that none of these are good or bad despite what different birth preparation methods may tell you! There are many ways to be in labour. We learn that it is important not to judge ourselves by the sounds we make or don’t make. While we may have an intention to be calm and quiet, we may find vocalising more helpful. We learn that labour can be many different things – a wild and crazy ride, a calm, a focused meditation, a determined and demanding physical and emotional marathon, a joyful and ecstatic experience. From reading many women’s stories, we can learn to recognise some pivotal moments in labour. The overwhelming and vulnerable moment when a woman feels she cannot go on, or she wants to give up and just have her baby in her arms by any means is a defining moment. This is a moment when she needs support, faith and sometimes to be challenged and reminded of what she is doing. This moment is one that has the potential to shape us as mothers. Stories also take us through the caesarean birth experience and help us to appreciate how this may also be made a beautiful and powerful birth. We can also learn how other women coped with a change in plans or unexpected and frightening circumstances. These stories are very powerful. They teach us that we can’t be guaranteed a perfect birth and this is perhaps the wrong goal to set our sights on. The reason positive stories are so informative and empowering is that they pass on the wisdom and memories of women who have had positive births and they provide us with information for all our senses. Reading positive stories builds confidence in our own ability to cope with birth because everything we read and connect with becomes part of our own knowledge, our own images and memories. Now we are able to go into labour with a whole library of helpful ideas, positive experiences, encouraging words, reassuring images and memories of how to birth – even if we have never given birth before! Reading stories from women who have had positive and empowering journeys show how incredible birth can be and reassure that giving birth is something we too can do. They prepare us for the many possibilities in birth and help us to work out how we may have the best birth for our unique circumstances. Reading positive stories may help women to acknowledge fears and concerns and begin to move beyond these to a more confident and positive perspective. 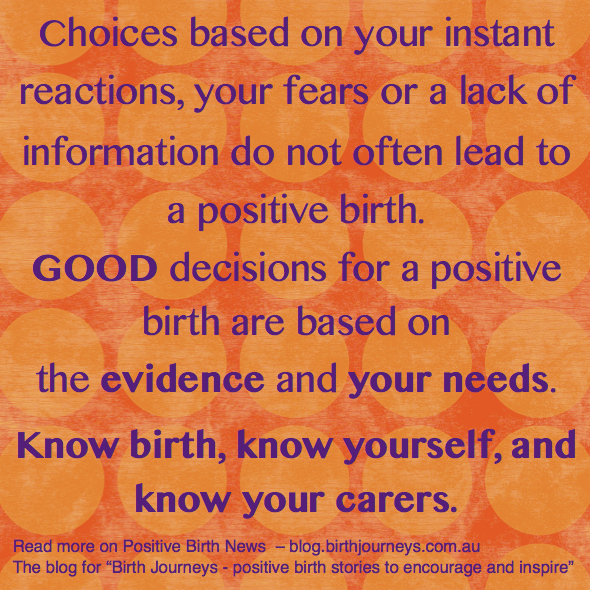 Positive birth stories show that no matter how you choose to have your baby, and no matter how your baby needs to be born, it is possible for you to feel safe, loved, respected and honoured throughout this experience. When you feel like that, you will have ownership and a positive feeling about your baby’s birth. Your baby will have the best welcome into the world – into the arms of a healthy, whole mother. Categories: Birth Information, Birth preparation, Birth Stories, Opinion | Tags: birth knowledge, birth ownership, contractions, dilation, guide to childbirth, negative birth stories, perfect birth, positive birth stories, timing | Permalink.